Please refer to our stock # 2892/426 when inquiring. 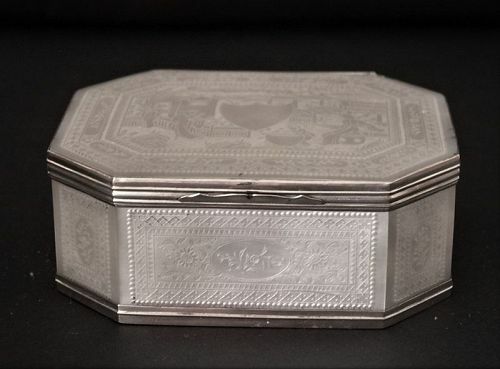 A Chinese mother of pearl box of canted rectangular shape and mounted with silver edgings. The cover is delicately and minutely engraved with a scene of figures at leisure in a pavilion surrounding a vacant shield. The sides bear panels of very finely worked flowers with geometric borders. The box is in excellent condition and superb quality craftsmanship. Age: early 19 C. size: 7.5cm x 6.3cm x 3cm high.